It's been said that history only remembers the winners, but in football that's not always the case as some teams have captured our imaginations, and then lived long in our memories with their brilliant play despite ultimately falling short of winning the World Cup. 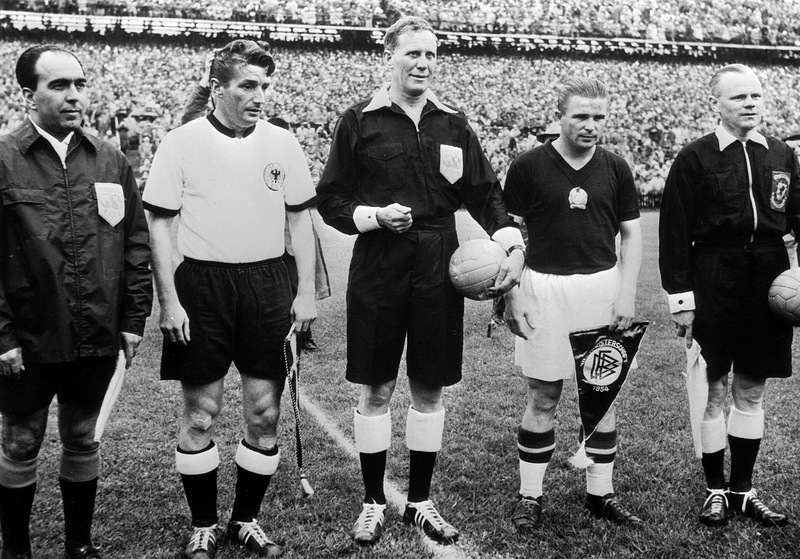 Ferenc Puskas and Hungary's Mighty Magyars had gone undefeated for four years coming into the 1954 World Cup in Switzerland and were heavy favourites to lift the Jules Rimet Trophy. Hungary, playing an early form of total football, had smashed England 6-3 at Wembley a year earlier and surprised no one by romping to the World Cup Final in Bern. Their opponents were a West Germany side who, like the country they hailed from, were still recovering from the devastation of World War 2. When Puskas and Zoltan Czibor put Hungary up 2-0 within eight minutes everything seemed to be going according to the script, but within two minutes West Germany got back into it. Max Morlock slide home the German's first on 10 minutes, before Helmut Rahn equalized in the 18th minute. After that the Hungarian's pressed and pressed, but despite laying siege to the German goal they could not force themselves back in front. With six minutes to go, Rahn struck again to complete a remarkable comeback and consign one of the finest team's the football world had seen to a 3-2 defeat. Unless you support Germany, if you mention the 1974 World Cup to most football fans of a certain age they'll almost certainly wax lyrically about the wonderful Dutch side of Johan Cruyff that swept to the final playing their glorious total football that summer. Managed by Rinus Michels, the Netherlands played a fluid brand of football with players interchanging positions and Cruyff conducting things using a style that had seen Ajax win three straight European Cups in the early 1970's. 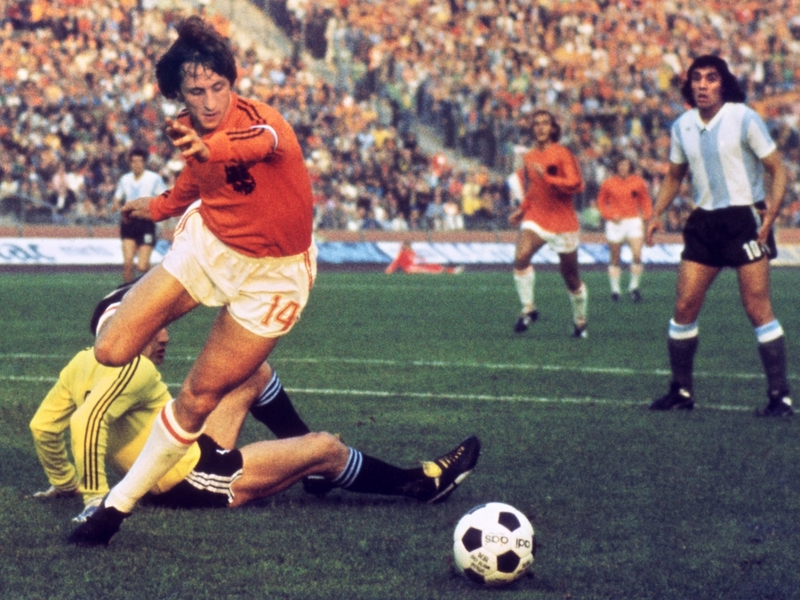 Facing the host West German side in the final the Netherlands were the slight favourites, but as they had in 1954 the German's spoiled the party overcoming a Johan Neeskens penalty in the second minute with goals by Paul Breitner in the 25th minute and a second by poacher supreme Gerd Muller in the 43rd minute. Despite chances for both sides in the second half, West Germany claimed their second World Cup hanging on for a 2-1 victory in Munich. Arguably the last Brazilian side to play in the thrilling samba style of old, the Selecao's 1982 vintage featured a chain smoking doctor named Socrates, the brilliant Zico and a terrific group of individuals who played like they'd just strolled in from the beach. Some of the goals this team scored are among the best World Cup stunners you'll ever see on YouTube. Sweeping aside New Zealand, Scotland and the Soviet Union in the opening group stage, Brazil then downed their old rivals Argentina 3-1 in their first second round group match and seemed prime to match the achievements of the great Brazilian sides of the past. Unfortunately, the cavalier play of manager Tele Santana's side proved to be their undoing against the eventual world champions Italy when some disastrous defending gifted Paolo Rossi a hattrick in a 3-2 win for the Azzurri in the final second round group match. Thanks to exited in one of the finest World Cup matches ever played and their inspired attacking brilliance throughout, this Brazilian side is considered by many to be the best team that didn't win a World Cup. For a country of only five million people, Denmark has produced a good number of wonderful footballers, several of which made up their 1986 World Cup squad. Nicknamed the Danish Dynamite, the 1986 squad combined brute force and smooth technique unlike any side the country has produced since, even the European Championship winners of 1992. Under German manager Sepp Piontek, the Danes might have been the most prepared team for the 1986 World Cup in Mexico having gone through intense altitude training and bruising training sessions prior to the tournament. With the talented Preben Elkjær Larsen leading the line, a 21-year old phenomenon in Michael Laudrup providing the creativity and the dynamic Frank Arnesen and Soren Lerby applying the drive from midfield, Denmark became one of the neutrals favourites in Mexico. Sailing through, what looked like on paper, a tough first round group, the Danes dispatched Scotland 1-0, hammered Uruguay 6-1 and then beat the eventual finalists West Germany 2-0. But in the second round the unbelievable happened. 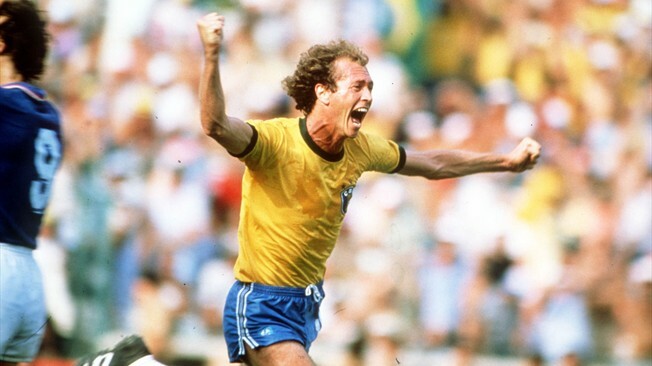 After going up 1-0 against Spain, and pressing their advantage, a calamitous mistake by Jesper Olsen allowed the Spanish to equalize through Emilio Butragueño. In the second half as Denmark pushed forward, some might say recklessly, they were caught on the counter attack four more times as Butragueño added three more goals to his name and Andoni Goikoetxea fired in a penalty to complete a shock 5-1 win for Spain. Denmark, a tournament favourite who had played some of the finest football of the World Cup in the first round, flew a little too close to the sun with wax wings. Everyone of a certain age remembers the wonderful Nike advertisement of the Brazilian team of 1998 moving a ball through an airport, and it was rather representative of the football they played at that time. 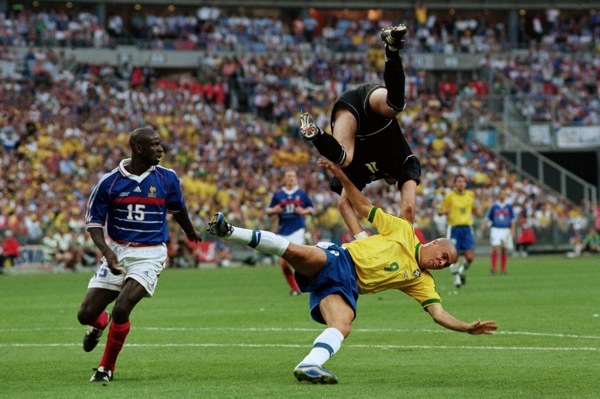 Although Brazil won the World Cup in 1994, and would win it again in 2002, it was the 1998 team with Ronaldo at his peak that captured the imagination. 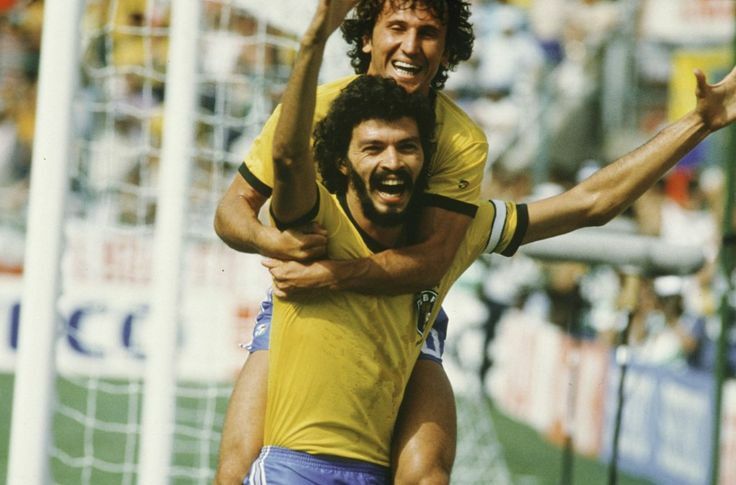 Led by manager Mario Zagallo, who guided the legendary 1970 Brazilian side to glory, Brazil breezed through the first round with their attacking trio of Rivaldo, Bebeto and that man Ronaldo firing on all cylinders. They crushed Chile 4-1 in the Round of 16, before narrowly edging out a surprising Denmark side 3-2 in the Quarter Finals. The Semi Finals saw Brazil take the lead against a very good Dutch team through Ronaldo in the 46th minute, before Patrick Kluivert levelled the score three minutes from time. Brazil held their nerve in the shootout though and advanced to the final. In the World Cup final against the host France, Brazil went in as the slight favourites despite the French having the home crowd advantage. Prior to the match though, Ronaldo suffered a seizure and was initially left out of the starting eleven. Despite being cleared to play, the best player on the planet at that time proved a non-factor as the South Americans wilted and were beaten 3-0.